CARGO - KITCHEN WORKING TABLE / Contemporary wooden kitchen furniture collection was born out of a desire to create the best possible cooking experience. By using carefully selected natural materials, craftsmanship and independent movable units we wanted to create a kitchen that lasts a lifetime. Studio Kaisa Amalia is a design agency based in Helsinki serving personal creative direction for your company. We create complete interiors, products and identities. Understanding peoples needs, dreams and desires - that is what our work is based on. To achieve the best possible result and end customer experience we watch, ask and listen. Curiosity is an important tool for us. We think all of our designs have to add something new and better to the world - and convey and evoke emotions. Good design is a interaction of sense and sensibility. It is about making life better, about happiness and well being. In our work process we use research, strategy and process thinking, but leave the space for sensory perception and intuition to bring out the best of it. We never start with empty table, we always take a careful look to history and the story, existing realities and future possibilities. Our approach is holistic and delicate. We understand the big picture but do the design on detail level. Quality, functionality, beauty and sustainability build the core of our design. We work with the clients who strive for excellence in their field - and want to make this world a bit better place to live and feel. Shared visions leads to successful outcomes. 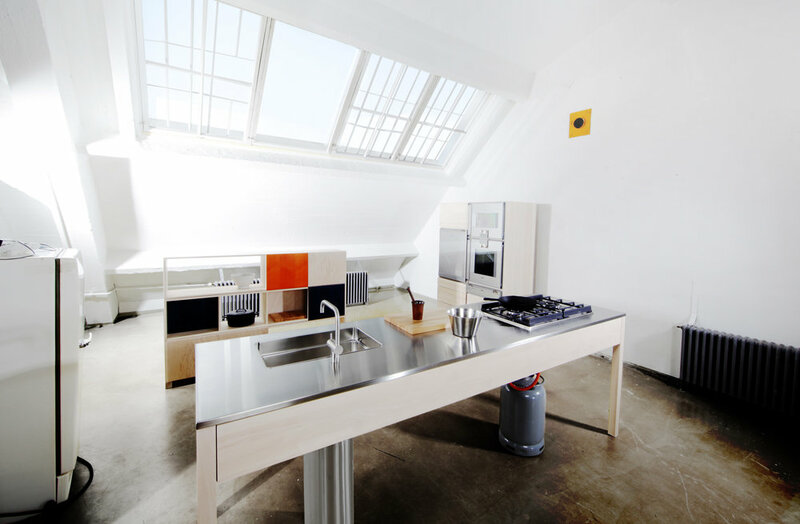 CARGO KITCHEN / We rethought the model of kitchen design. The kitchen adapts different types of architectural concepts. 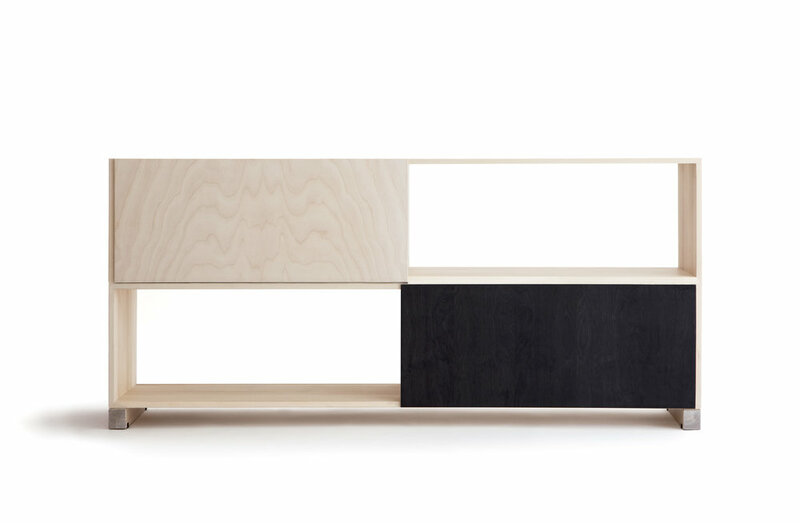 In collaboration with Scandinavian Carpenter Collective. Kitchen working table. Drawer for the most important utensils needed when prepairing food, such as a cutting board and knives. CARGO KITCHEN - OVEN UNIT / Free standing oven unit with two drawers for pots and pans. For us the most important thing in interior design is that people enjoy themselves and feel empowered in the space. And that is not the minor thing what it comes to business - was it about a medical lounge, a restaurant, a shop or your own office. Designing an interior is more than creating a visual and functional space. Interior have to work and it have to touch - it have to function on many different levels. People construe the world through the all senses. We want to create spaces that resonate with people and their behaving and emotions. That is realised through careful material and colour choices, scale and proportions, lights, sounds and smells - and deep understanding the nature of the space and the possibilities. When designing an interior we don’t start with the empty sheet of paper. We look where we are coming from and where we are now. We look history and the story of the place. We look what is in your archive and what is your vision as a business leader. We think what can we add, what kind of quality we are looking for. Considered details and added layers create rich environment - whole composition. Good interior design is like a music composition for the orchestra. THEATRON SERIES FOR VIVERO / Theatron is a chair for differend kind of situations like casual meetings and environments like lounges and conference rooms. Comfortable chairs offer homely feeling. The material palette is natural. Seat and arm rests are bent from one single piece of wood veneer using special two-way pressing method. Upholstery is wool and strong leg structure is made of stainless steel. Theatron chair is designed from the idea that details should be rather felt than see. The sitting position is very comfortable and special: by lifting arms on arm rest you can have advantage of casual easy chair seating. It has been studied that people always make their decisions based on emotions and later on justify it with logical reasons. That is why the creating emotional experiences is the most important thing when you want to gain committed end customers. Reliable and loveable identity is always based on true story behind the company. There is something special in every successful company and a reason it to exist. Our focus is to find that and bring out the best from your company using design methods and understanding what makes people happy and connect your brand and each others. To achieve beautiful, functional and emotionally approachable identity it means that every detail in your business have to speak the same language. Where ever people come across with your company, all the elements and layers of business identity has to transmit the same message and create same feelings. We think it as whole: webpages, your business cards, workers outfits, way they behave, interiors and so one. Besides aestethics, tactility is very important role in interior and product design, but also other physical appearance of your company like the stationary. In digital world we use stories and images to engage the feeling. It is important that your websites are delivering the same message than the physical elements of your business. CELEBRATION - SHAMPAGNE GLASS / This shampagne glass is something you rather have to experience than see. Heavy bottom and smoothly tilted shape offer special feeling when using it. Each piece is unique, hand blown by master craftsman. The glass highlights the beauty of the chance and imperfection. We create essential, long lasting products that are easy to use and appealing visually and emotionally. True design evokes emotions in order to be true design. It adds something new and better to existing world. In design work delicate sense of proportions and material is what makes the quality and the functionality. Week seek pure, poetical form and clear composition and structures. We pay attention to feel and sensory perception of the object, we think how it feels to touch the surface. We look the nature of material. The form and the material have to adapt to the human body. Good design is easy to understand. It suits to different types of environments from rich to minimal. Objects needs to communicate to human being. You could almost say that there is no material or colour that is not good, it’s more about the way it’s used. Through intense concentration we find the right elements and right proportions to suit the need best. Our design is a interaction between function and beauty, sense and sensibility, technology and craftsmanship. We like to fuse industry and craft, high- and low-tech, traditional and contemporary. The hight level of quality and exquisite craftsmanship is what we believe in. Our product design work covers a wide range, from tables, to chairs, to storage furniture, to kitchen furniture, to tableware, to textile, to office furniture, to ceramics, limited edition designs and artistic projects. We design whole product concepts based on our understanding of both the brand and its users. Holistic approach and detailed design process is a key to a successful product concept. Understanding supply network, product development, quality and responsibility issues, logistics needs, volumes and finding right pricing point. All that needs to be take on notion from the beginning. In product design process we always start with the research and strategy. The process begins in our studio in Helsinki with the drawings and mock-ups: shaping, gluing, making calculations. Producing scale models eventually turn to 1:1 prototypes to be tested in real use. HIDE & EXPOSE - STORAGE UNIT / With smoothly slinding doors it is possible to hide or expose the wanted objects. 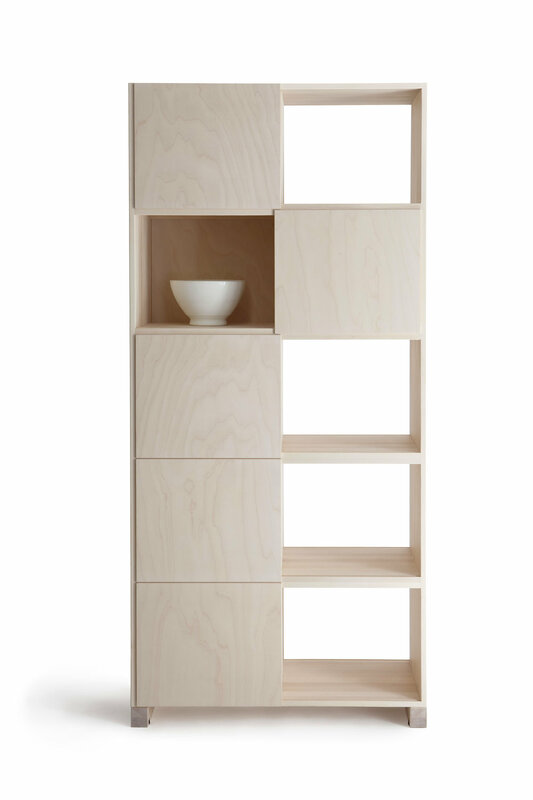 From both sides usable storage unit divides the space or can be used besides the wall. "In my design the human experience is at the center. For me design is visual and sensible thinking based on understanding on peoples needs, desires, behavior and what makes them feeling well in their daily life. My mission is to create beautiful, long lasting and functional design based on empathetic understanding, intuition integrity and well thought process thinking. These are the keys to succesful project." Designer and Interior Architect Kaisa Amalia Alaräihä (b. 1979) is the founder and creative director of design agency Studio Kaisa Amalia. Kaisa Amalia Alaräihä graduated 2010 from Aalto University of Art and Design Helsinki, as Master of arts (MA) in Furniture Design and Interior Architecture. Already since 2005 she has pursued independent projects for clients in different fields. Her work across wide number of product typologies such as furniture, glassware, books, prints, graphic and spatial design. She also has worked on concepts for institutions and brands. In 2017 she founded the Studio Kaisa Amalia continuing her work towards more beautiful and helthier environments and life. She have awarded with first prize in Chairs Design Festival Competition, first prize in Hotel Fasade Design Competition and second prize in Helsinki City Theatre Furniture Design Competition. Grants include Finnish Cultural Foundation grant and Arts Council of Finland grant. Works by Kaisa Amalia Alaräihä have been shown at museums, galleries and festivals such as Helsinki Design Week Main Exhibition (FI), 5x3 Design Visions (FI), Habitare Aikamatka - Finnish Design from 1950s to 2000s (FI), Pro Puu Gallery Koko Koti (FI), Nordic Home in Seoul Design Museum (KR) and New Finnish Design Scenarios, New York (US).